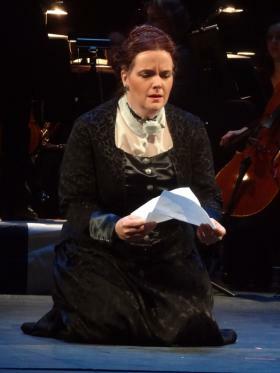 The opera Mrs. President is being performed Saturday night in Rochester. It tells the story of the first woman to run for president, which happened earlier than you might think. In 1872, women couldn’t legally vote in America, but that didn't stop Victoria Woodhull from running for president that year. She’s a complicated, fascinating figure from American history, but not as well know these days as other women’s right activists of the late 19th century. Composer and conductor Victoria Bond was drawn to Woodhull’s story. Victoria Woodhull is the subject of an opera, Mrs. President, written by composer Victoria Bond and librettist Hilary Bell. Bond is in Rochester to conduct her opera this week, and talked about creating music for this fascinating historical figure. And oh, the characters in this opera - ripped from the headlines of the 1870s. In addition to Victoria Woodhull, there is Henry Ward Beecher, a charismatic preacher who is helping to free slaves, and will also do anything to cover up the affairs with his parishioners. He tangles with Woodhull, who threatens to expose his seductions in her newspaper – trying to blackmail him into supporting her presidential bid. Election night 1872 finds Victoria Woodhull locked up in jail and denounced as “Mrs. Satan” in the press. Susan B. Anthony, casting her famed illegal ballot that year, voted for Ulysses Grant and not Woodhull. Frederick Douglass, who was listed as Woodhull's candidate for vice president, also voted for Grant. In the opera, Victoria Woodhull looks beyond all the setbacks, confident that a “thousand more will rise” to carry on what she has begun. The opera Mrs. President by Victoria Bond is being performed at the Lyric Opera Theatre on East Avenue Saturday night at 7. Click here to listen to an extended conversation with composer and conductor Victoria Bond about Mrs. President, how experiences as a Hollywood ghostwriter shaped her music, and more. Copyright 2017 Classical 91.5 WXXI-FM. To see more, visit Classical 91.5 WXXI-FM.